I am sure it is abundantly clear that I have a love for beautiful books, especially ones that are about houses. I particularly like books on privately owned houses (especially ones in Europe), as they provide a portrait of the architecture, interiors, landscape, and inhabitants that would normally not be revealed to the public. I have recently read a book (and yes, I read it cover to cover!) that now has a prominent place on my library coffee table - The Scottish Country House, by James Knox. Weighing in at 4.1 pounds, with 208 pages, it is a beautiful focal point on my table. Inside, it is full of page after page of gorgeous pictures by James Fennell. The book is a fascinating read too. Each chapter delves into a single house, its history, the architectural background and features, the contents of the house (the furniture and collections that create the layers of personality unique to each house), the landscape, and the story of its inhabitants. In the author’s words, “the Scots are known for their hardiness, and this tale of ten houses is one of remarkable longevity played out against the background of Scottish history. With one exception, all of the houses are still lived in either by the families who built them or by those who have owned them for generations”. This is fascinating stuff coming from a place (Atlanta) where a house from the 1920s is considered very old. It is particularly interesting to learn how the generations who inhabited the houses made their own marks on the houses through the years, from renovations to decorations. 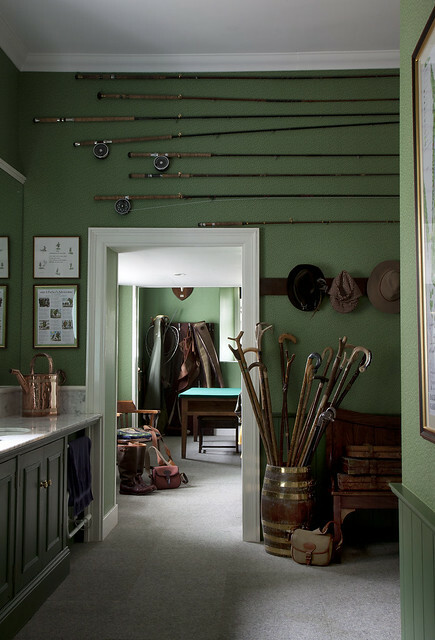 The photography in the book is incredible; James Fennell took the pictures that illustrate the 10 Scottish Country houses profiled in the book (I spent hours poring over the pictures – each picture has dozens of interesting details). In the words of the author: “The Scots engaged with their sublime landscape long before the cult of the picturesque awoke the rest of Britain to the pleasures of a good view”. One of my favorite pictures from the book. 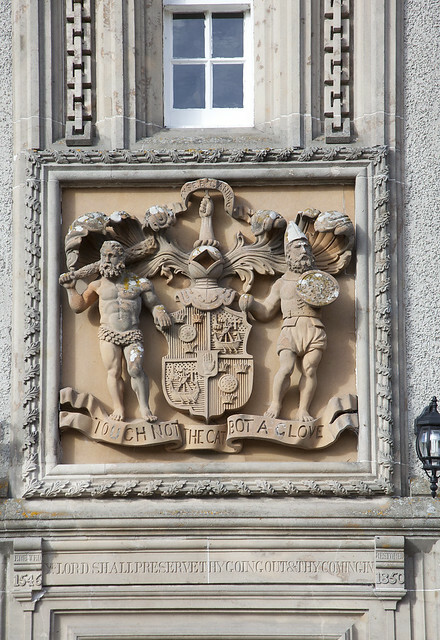 The coats of arms of many of the original builders of the houses are often incorporated into the architecture of the exterior and the interior. There are many casual and informal rooms that are featured in the book, which provides a more complete view of each house. 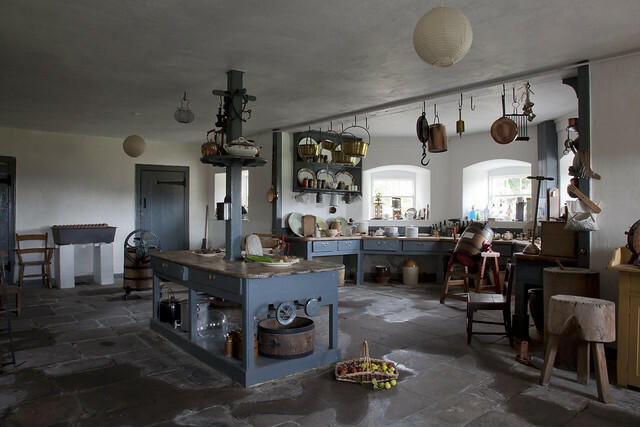 I particularly liked seeing some of the kitchen pictures – it is almost as if this kitchen has been frozen in time! The architecture of this room in the House of the Binns caught my eye. 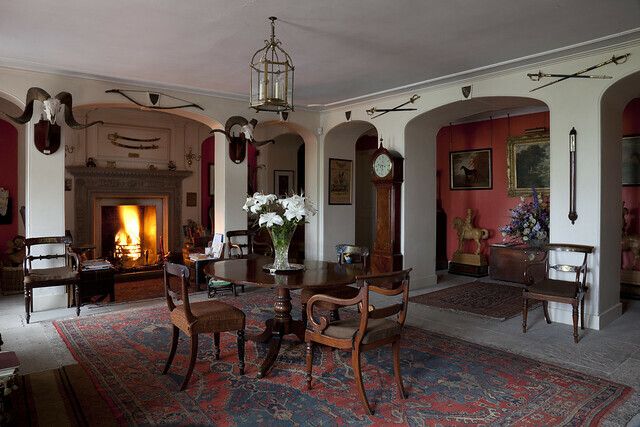 It was originally two rooms, combined into one, with the original Jacobean fireplace preserved (dated 1622). 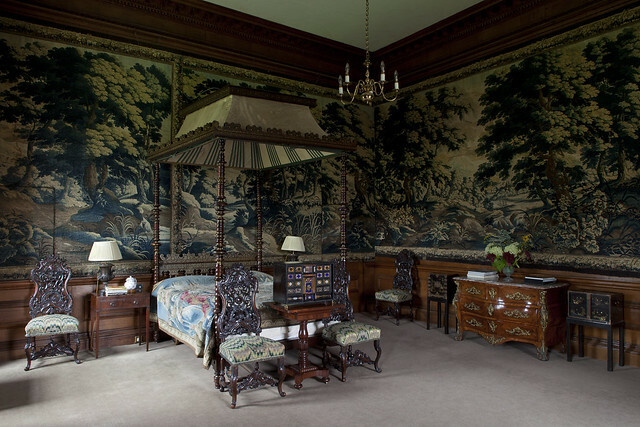 A tapestry lined bedroom in Drumlanrig. 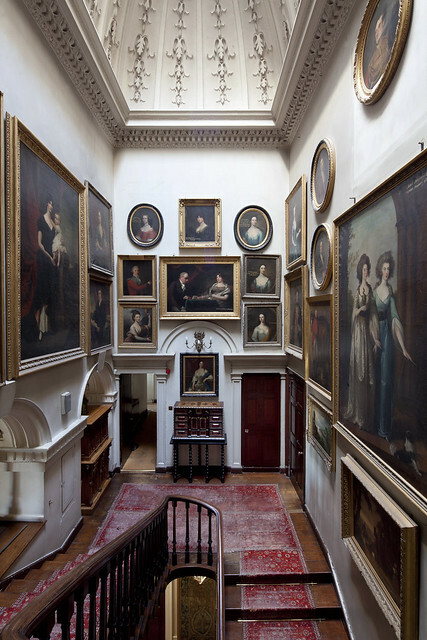 Gallery walls abound in many of the houses, reflecting the generations of inhabitants. Even the runner in this picture reflects the tread of the generations. I love how the portraits are hung to reflect the lines of the architectural details. A formal paneled room with a breathtaking ceiling. 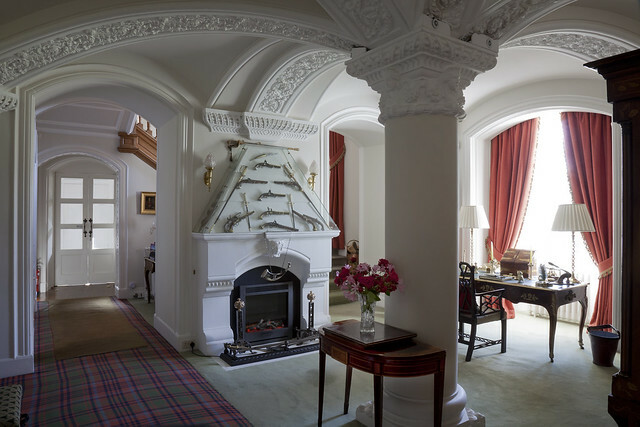 There are often French elements in these homes, both in the architecture and the interiors, reflecting the historical alliance of Scotland and France. 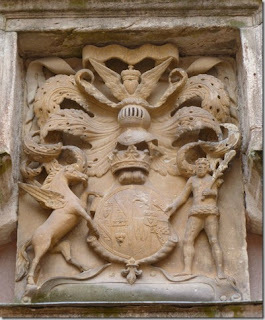 Many of the houses have the coats of arms from the family who built the house carved right into the architecture. 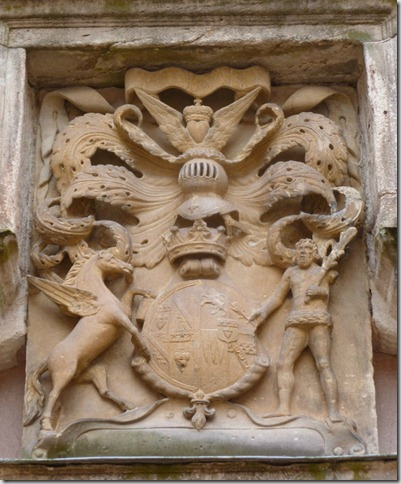 I was particularly taken with the Queensberry coat of arms from the castle of Drumlanrig – note the winged heart, which appears in the house both inside and out. This image is not from the book (I could not find a digital image of the winged heart from the book, although there are several lovely examples in the book itself). 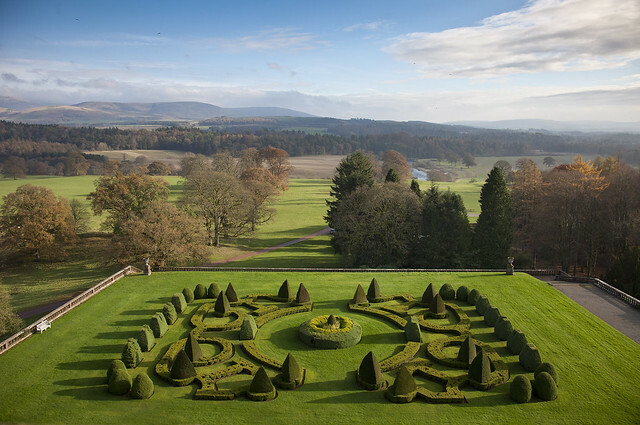 One of the houses profiled in the The Scottish Country House is Dumfries house, designed by Robert and John Adams. 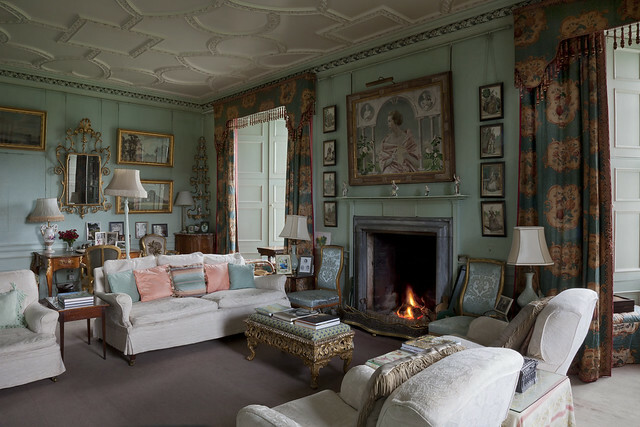 In 2007 the house was rescued from sale and disassembly of the original furniture collection ; the negotiations came down to the wire – apparently the original Chippendale furniture had already been crated by an auction house and was en route to London when the final negotiations to save the house and its contents were finalized. The Prince of Wales and a group of preservationists organized the effort and fund raising, and Prince Charles gave Architectural Digest a tour in a recent article (http://www.architecturaldigest.com/decor/2012-02/prince-charles-dumfries-house-scotland-article. 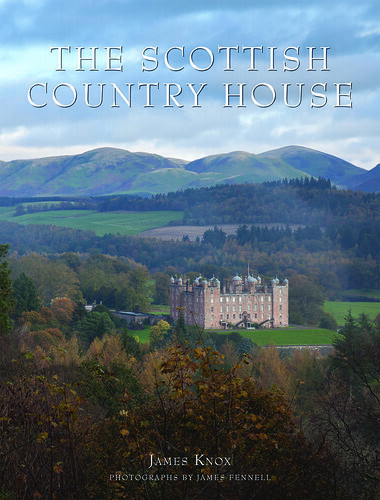 To purchase The Scottish Country House on Amazon, please click here. Images (except as noted) and courtesy copy of The Scottish Country House provided by The Vendome Press. Stunning interiors and that landscape! I am awed. Heading to amazon now. 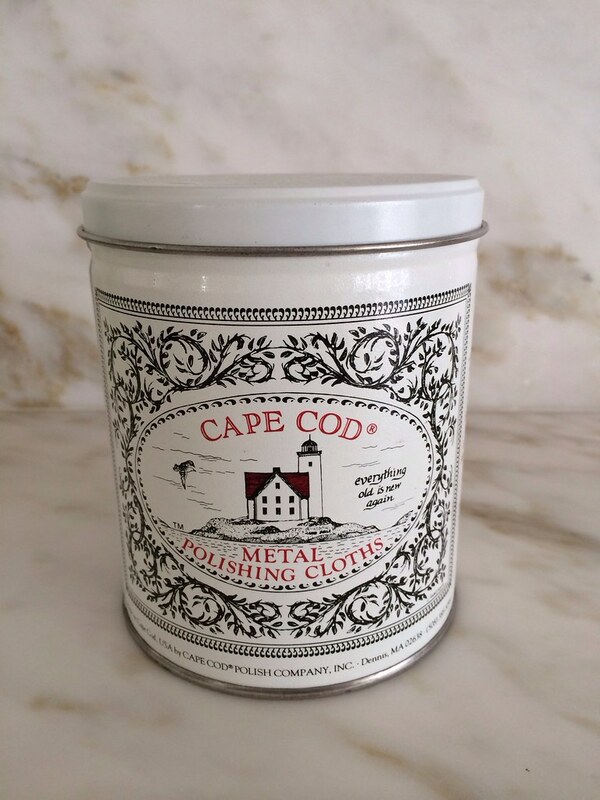 Thank you for providing the perfect Christmas present idea for my (impossible to buy for) mother in law. She will love this book. Absolutely stunning images. So warm and beautiful. 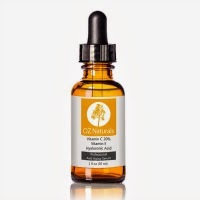 I am adding this to my list. I love stair galleries. There are so many vantage points. Where else can you look down at pictures? Well be still my heart. 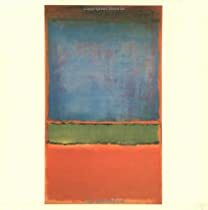 I sat at a coffee house one day and spent hours in a similar book, but this one seems to dwarf in size according to your description. The landscape, architecture, art and furnishings, total adoration! 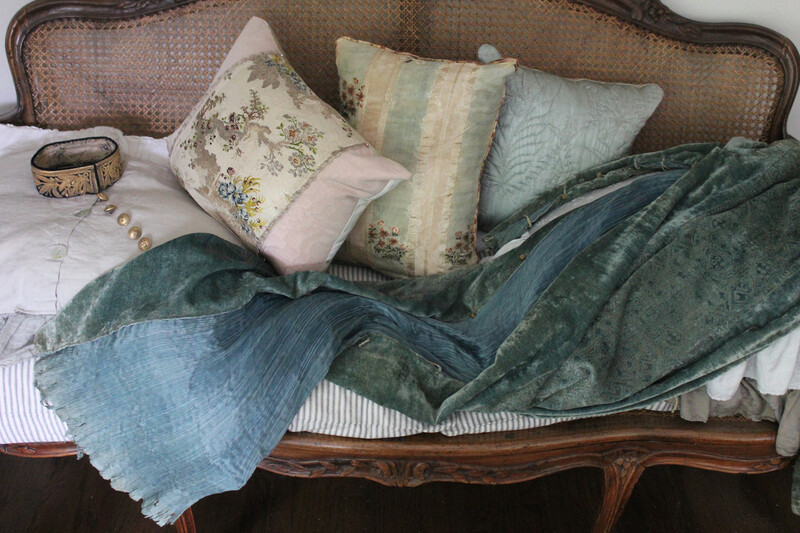 ~ Tina PS hope you will post more images of your home this holiday. I need to be better about taking the time to read such wonderful books like this! We sell several here that I have not had a chance to even read yet! I here they are wonderful! Thanks for sharing your insights on this one! It may go on my Christmas wish list! Over 2 decades ago when I began going to Europe to study gardens I knew SCOTLAND was where to start. They trained/educated more head-gardeners across Europe than anyone. 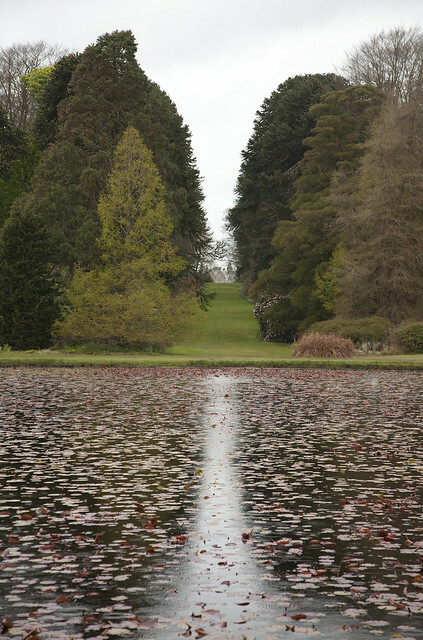 Wish you had been on that trip a quarter century ago, studying historic gardens across Scotland. to inform the reality however I'll certainly come again again. wow, the photos are absolutely beautiful! I think i'd read this book cover to cover too! thanks so much for sharing. 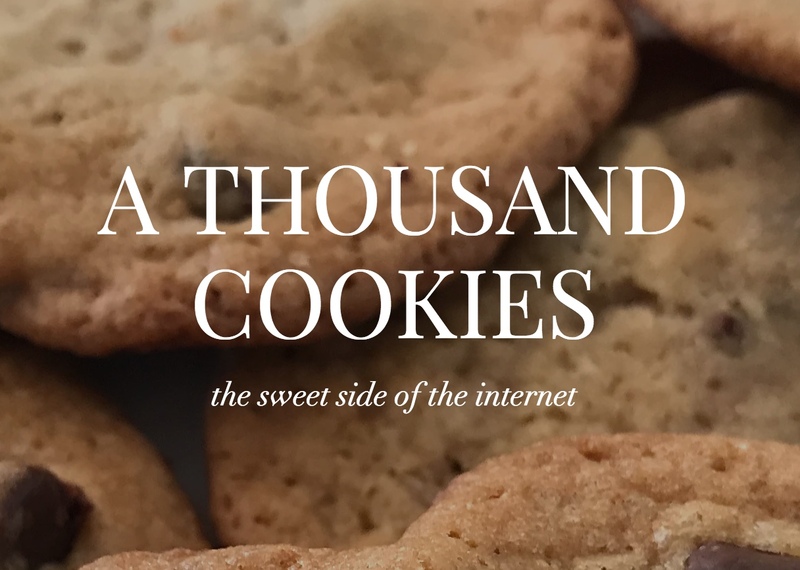 I surprise how much effort you put to create this sort of fantastic informative site. What a treat this book is. 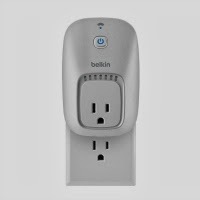 It is now on my list of "must haves". Thank You for sharing. How fast can I get to the bookstore??? Awesome pictures! I am looking forward for more! Thank you! I've been writing up my trips to many of these houses from July 2014 and a combination of time lapse and not being allowed to take photos of many of the interiors has proved a stumbling block. so I've ordered the book!